The city walls of York are the most complete example of medieval city walls still standing in England today and extend for 2.5 miles, enclosing a total area of 263 acres. York's original city walls were constructed in about 71 AD, when the Romans erected a fort which occupied around 50 acres near the banks of the River Ouse. The rectangle of walls formed part of the fort's defences. These Roman fortress defences included six gateways, and their siting has influenced the street pattern of the city to the present day. 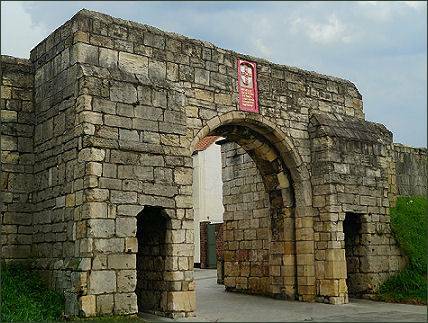 The south facing Fishergate Bar is one of the six gateways in the city walls and consists of one main arch and two smaller pedestrian ones. The first recorded mention of the Bar dates from 1315, where it is referred to as 'Barram Fishergate' The current structure dates from 1487 and is surmounted by the coat of arms of York. It was built by Sir William Tod, mayor of York. The Earl came to deliver the King's demand and collect the taxes, however, on the 28th of April, 1489, at a meeting he had arranged with the citizens to discuss their grievances about the taxes, an angry mob, led a man called Chambre, claimed that Henry's predecessor, King Richard III, who was popular in Yorkshire, would never have allowed his people to be oppressed by such a heavy tax, and that the Earl was a 'scurvy rogue'. The mob of deeply angered citizens attacked the earl, who was then "furiously and shamefully murdered and killed" as they tore him apart. Soon after this the revolt was supressed and the gateway was bricked up. It was re-opened until 1834, to provide access for the cattle market. A commemorative plaque on the gate recalls the rebellion of 1489. 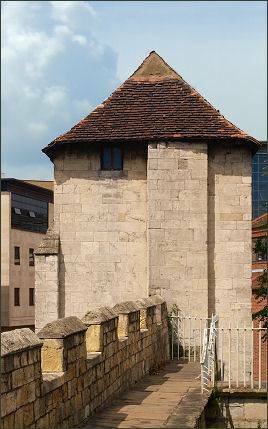 The Fishergate Postern Tower, one of six original postern towers on the walls and a Grade I listed building, marks the end of the medieval walls in the section to the east of the Foss that runs from the Red Tower. The present tower is the second postern tower to occupy the site. The first tower was known as the Talken Tower, named after Robert de Talken, a wine merchant, who was York mayor in 1399. The present tower was built between 1504 and 1507, with the exception of the tiled roof, which was added in the sixteenth century. The Postern itself is a small entrance with a pointed archway, the only surviving one of its type left in York. There is a groove inside which once held a portcullis. The River Foss divides the postern tower from the castle, the river was much broader in earlier days and came up to the edge of the Postern Tower. The 4-storey tower with postern (a small gate) attached was built between 1504 and 1507. 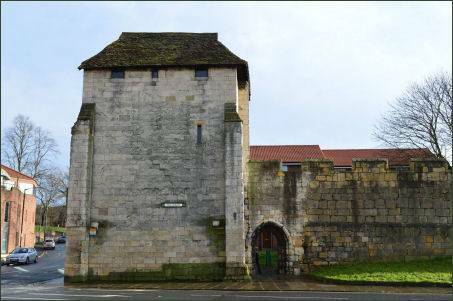 In around 1068, William the Conqueror ordered water from the River Foss to be diverted at Fishergate to fill a moat around his castle at York. Damming the River Foss to supply water for the moat resulted in large-scale flooding. The flooded area became known as the King's Fishpond and, though the water has long since gone, the area still retains the name 'Foss Islands'. The Friends of York Walls open the tower on a regular basis as a community and educational hub.